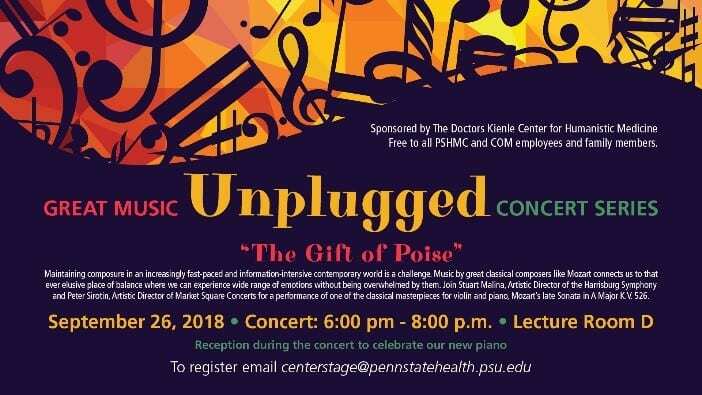 The first of three Great Music Unplugged events, a Kienle collaboration with Peter Sirotin, featured acceptance of the generous donation of a Steinway D concert grand piano in Lecture Room D. Keith Cheng, MD, and Shou Ling Leong, MD, selected, purchased and donated the piano. 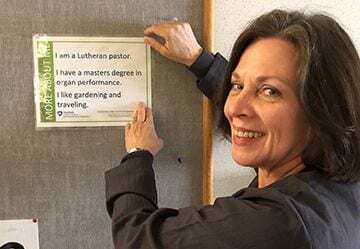 They worked with Robert Rinaldi, executive vice president for service and chief operating officer of Jacobs Music Company in Philadelphia, to select just the right piano to enrich our medical community. 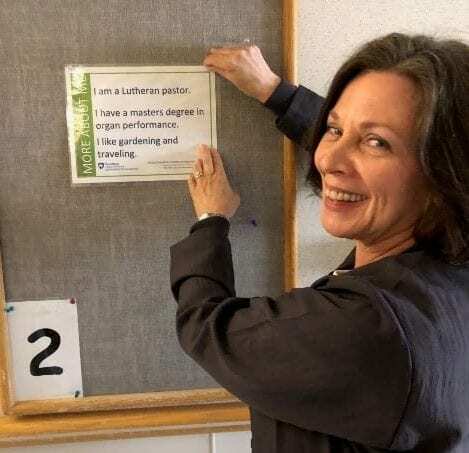 Lorna Davis posts a “More About Me” poster in a patient room. Kienle piloted a program in which our staff visits with patients admitted to the hospital. During a brief chat, we learn three important nonmedical pieces of information about the individual. We post these three items over the patient’s bed so that healthcare providers can engage with the patient on a more personal level. Two days later, we return to the room and ask the patient how many providers referred to the information on the sign. 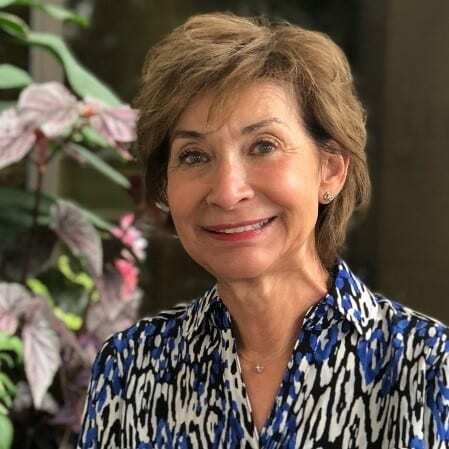 We look forward to growing this program in 2019 and to researching its impact on patient and healthcare provider experience. LaDora Field joined Kienle staff to help initiate “More About Me” in the 12 rooms on the 3rd floor south addition where patients are admitted for longer-term stays. Center Stage Arts in Health answered The National Academy of Medicine (NAM) call for artists to submit examples of art to show what clinician burnout, well-being, and resilience means. 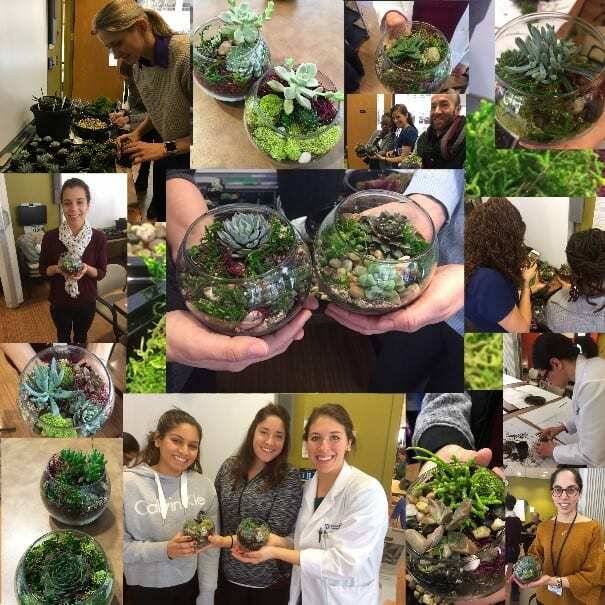 With the support of funding from the Doctors Kienle Center for Humanistic Medicine, Center Stage Arts-in-Health created a workshop on “Clinician Well-Being & Resilience Through Art,” which included a musician and several guided art projects. The resulting descriptive poster was awarded winner status by NAM. The event was featured in a nationwide NAM pop-up gallery in May 2018 at the National Academy of Sciences. NAM’s review committee thought the “Resiliency Workshop” was particularly insightful and a thought-provoking addition to its exhibit. In addition, Penn State employees’ artwork will be displayed in a permanent online gallery at nam.edu/expressclinicianwellbeing. The pop-up gallery was hosted in Washington, DC, in conjunction with a public meeting of NAM’s Action Collaborative on Clinician Well-Being and Resilience. Kienle and Center Stage Director Claire de Boer attended the collaborative meeting. 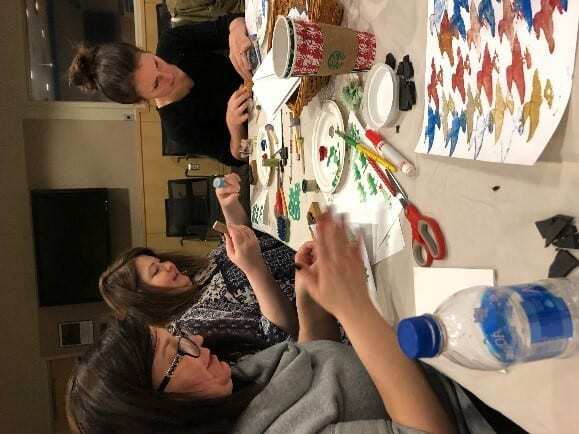 Healthcare providers, who are also moms, enjoying a night creating art. “Moms in Medicine” enabled healthcare providers, who are also mothers, to come together to share their experiences. 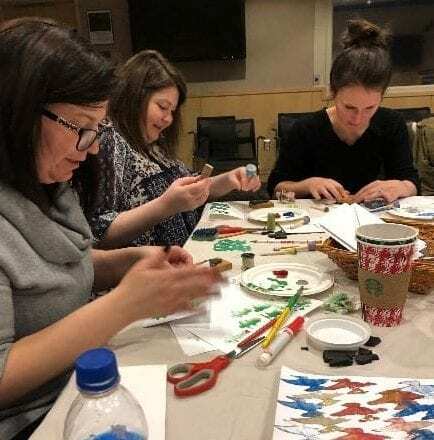 Also they have the benefit of a guided “Art as Self Care” project taught by professional artists and hosted by Center Stage arts in health staff. This activity is created to be a peaceful night out, to build community with others finding their way through this intense time in their lives.